Joseph Grinnell (1877-1939) was Professor in Zoology and the first Director of the Museum of Vertebrate Zoology, UC Berkeley. Like the great John Muir, he was one of the most important naturalists of his time. His main area of study was that of the formation of species in nature. Most of his work was in western North America, particularly in California, where he led many extensive expeditions. He was also a visionary, who could see that the rich and unique vertebrate fauna of California was under siege from increasing impacts of human population growth and unsustainable land use practices. Joe Grinnell had an incredible childhood by any standards. He was born in 1877 in Indian Territory on the Kiowa, Comanche and Wichita Indian Agency in Oklahoma. His father was the agency doctor. In 1880 the family moved to the Dakotas, where the father was treating the great Sioux Chief Red Cloud. Young Joe grew up among the Sioux. he was a favorite of Red Cloud. One can’t divorce this upbringing from Grinnell’s later mastery as a field naturalist. His Sioux period had to have shaped his senses and conceptions. The Indians subscribed to a drastically different worldview from the Whites with European ancestry. Joe spent his childhood playing with the Indian boys, living nature through eyes and ears honed by those associations. In 1898, at age 21, Grinnell took a schooner into the Bering Sea during the Alaskan gold rush. This was the first expedition of his career. He searched for specimens, both of the natural and gold varieties. Grinnell’s specimens still reside in the museum at Berkeley today, all meticulously labeled by his hand, and those of his students. I stumbled onto the museum, located in the Valley Life Sciences Building, one afternoon while I was tooling around campus. It’s an amazing place. When you enter you are immediately confronted by the skeletons of a Tyrannosaurus Rex and a pterodactyl!! “In Vertebrate biology, he is probably the most important person in the early 20th century. There is hardly a mammalogist or ornithologist in this country that doesn’t trace his or her lineage to Grinnell” according to his disciple Jim Patton, former curator at Grinnell’s Berkeley museum. Grinnell was also instrumental in shaping the philosophy of the National Park System and his commitment to wildlife protection and conservation was borne out most visibly through his research in Yosemite National Park during the first two decades of the 20th century. His theory of the “ecological niche”, published in 1924, has proved to be one of the organizing principles of nature. The concept goes like this: in nature there is competitive exclusion—that is, no two species can occupy the same niche for a period of time without one excluding the other. Frankly, anyone who cares deeply about protecting the environment and the national parks owes a great debt to Grinnell and his students. Why? Because recent surveys of Yosemite have turned up some troubling results. It seems that nearly all species used to living in cold weather through evolution have moved to ever higher elevations. For scientists, the unquestioned culprit in this developing potential tragedy is global warming. For creatures adapted to the highest elevations there is an even greater sense of urgency because there is no place higher to go!! These are massive and most likely permanent changes in the park. Without Grinnell’s records from his comprehensive Yosemite surveys we wouldn’t have a baseline by which to measure the transformation. 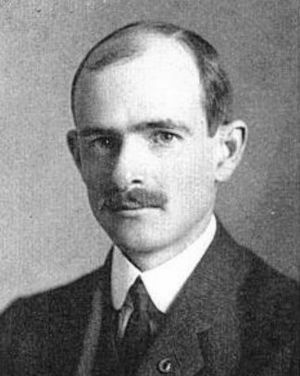 Joseph Grinnell served as the Museum of Vertebrate Zoology’s Director from 1908 until his death in 1939.